A Stark County food pantry that was struggling to keep enough food on its shelves got a big boost when a Perry Township resident decided to donate a shopping spree. Jennifer Zartman bought a raffle ticket to support World Elite Idols, a special needs cheerleading group, and she won. Her prize was a 90-second grocery grab at the Buehler's store in Massillon. "I was having fun, but again, you only have so much time," Zartman said. Zartman decided to target staple foods and collected $242 worth of cereal, soup, canned vegetables, pasta and other items. She never intended to keep any of the food for her family. 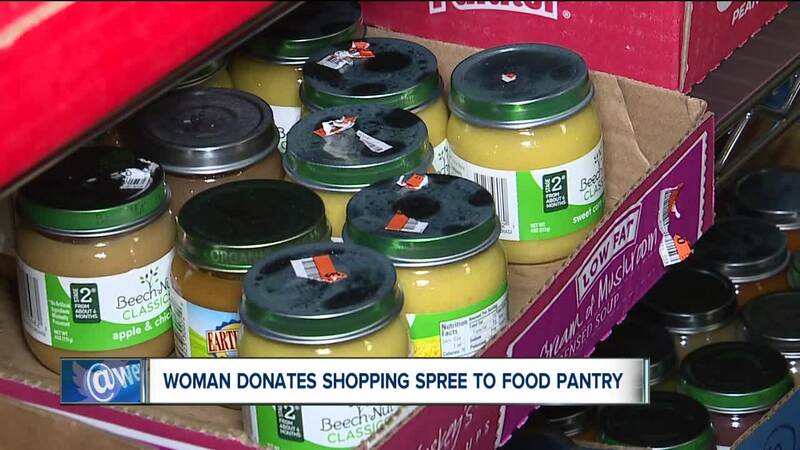 Instead, she donated her haul to the Perry Helping Perry food pantry housed in Trinity United Methodist Church. "There's so much negativity out there and you can do something positive," she said. "It just feels right because my cupboards are always full." Her employer, Park Tree Investments, matched the dollar amount. Word of Zartman's generosity started to spread around Perry Township and others started to give. "This started, I called it a tsunami," said Brett Huntsman, the director of the pantry. Dozens of new donors brought in canned goods, baby food, diapers and cash. Unexpected local company contributions —in the thousands — have also rolled in. Some businesses have dropped off large amounts of food. "Because of her, we have hams. Fresh Mark donated 130 hams. We have Smith Dairy donated ice cream, yogurt and milk," Huntsman said. Zartman also started a "30 for Thanksgiving" campaign on Facebook, challenging her friends to either donate $30 to the pantry or buy $30 worth of food. That effort has generated another $720. The influx in donations is also allowing the pantry to buy several snacks for a program aimed at helping kids in need of food. Huntsman said all of this is coming at a critical time when many of the shelves were sitting empty. "It's coming at the perfect time because Thanksgiving is our largest handout." Zartman is touched by the chain reaction acts of kindness and realizes the food she gathered in a minute-and-a-half could feed families for several weeks. "That's the thing about hunger is you don't put a sign on your front door that says, 'We're hungry,'" she said. "To know that the little things, and a lot of people doing a lot of little, can make a gigantic difference."